We’d love to hear from you. Here’s how to contact your local Twinkles Nursery. Twinkles Boston Spa is located in the grounds of St Mary’s Primary School in the village of Boston Spa in West Yorkshire. It was the first nursery in the Twinkles group, opening it’s doors in November 2003. The 53 place nursery offers full day care for children aged 6 weeks to 5 years and the 32 place Out of School Club provides before and after school care for children up to 11 years. The nursery is from 7.30am until 6pm, Monday to Friday, 51 weeks of the year with the exception of Bank Holidays and a week at Christmas. Children attend for a variety of sessions and the nursery is flexible to your needs. The nursery provides funded early education for two, three and four year old children. Support is provided for children with special educational needs and/or disabilities and children who speak English as an additional language. Twinkles Boston Spa were listed in the Day Nurseries Top 10 recommended Nurseries in Yorkshire & Humber in 2015. Twinkles Knaresborough is located on Manse Lane in Knaresborough in North Yorkshire. It’s the third nursery in the Twinkles group and opened it’s doors in September 2012. The 92 place nursery offers full day care for children aged 6 weeks to 5 years and the 8 place Out of School Club provides before and after school care for children up to 11 years. Twinkles Knaresborough were listed in the Day Nurseries Top 10 recommended Nurseries in Yorkshire and Humber in 2014 and 2015. They were also the winners of the Harrogate MUMbler Day Nursery of the Year Award in 2014 & 2016 and were shortlisted in 2015. Our nursery opens from 7.30am until 6pm, Monday to Friday, 51 weeks of the year with the exception of Bank Holidays and a week at Christmas. Children attend for a variety of sessions and the nursery is flexible to your needs. The nursery provides funded early education for two, three and four year old children. Support is provided for children with special educational needs and/or disabilities and children who speak English as an additional language. Located in the heart of Leeds City Centre just off Call Lane, Twinkles Leeds were the third nursery in the group, opening in March 2013. The 100 place nursery offer full day care for 106 children aged 6 weeks to 5 years. Twinkles Leeds were listed in the Day Nurseries Top 10 recommended Nurseries in Yorkshire and Humber in 2014, 2015 & 2016. Our nursery opens from 7.30am until 6pm, Monday to Friday, 51 weeks of the year with the exception of Bank Holidays and a week at Christmas. Children attend for a variety of sessions and the nursery is flexible to your needs. The nursery provides funded early education for two, three and four year old children. Support is provided for children with special educational needs and/or disabilities and children who speak English as an additional language. Our childcare setting on site at the White Rose Office Park. This purpose built, 95 place nursery opened its doors in September 2014 and is the fifth nursery in the group. Twinkles White Rose can be found on the White Rose Office Park, located next to the White Rose Shopping Centre in Leeds, West Yorkshire and has excellent motorway links nearby. It provides quality childcare to both staff on the White Rose Office Park, and families in the surrounding area, taking children from 6 weeks to 5 years old. Our Nursery Chef, was a finalist in the NMT Nursery Awards in 2016. Twinkles Oxford Place is the newest nursery in the Twinkles group and opened in October 2016. Situated on Oxford Place, in the heart of Leeds City Centre, Twinkles Oxford Place is just a short walk from Leeds Train Station and the City Square when many buses depart from. The 60 place nursery provide care for children aged 6 weeks to 5 years and is the first of our nurseries to offer a soft play room as part of its facilities. Twinkles Oxford Place were shortlisted in the Nursery Launch Category at the NMT Nursery Awards in 2017. The nursery is regulated by Ofsted. 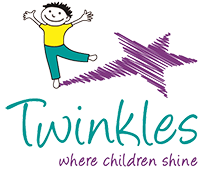 Twinkles Wetherby is situated in purpose-built premises in the grounds of Crossley Street Primary School, Wetherby in West Yorkshire, serving families from the local and surrounding areas. They were the second nursery in the Twinkles group, opening their doors in April 2008. The 73 place nursery provides care for children aged 6 weeks to 5 years and there is an Out of School club located nearby for up 20 children. The nursery opens from 7.30am until 6pm, Monday to Friday, all year round with the exception of Bank Holidays and a week at Christmas. Children attend for a variety of sessions and the nursery is flexible to your needs. The nursery provides funded early education for two, three and four year old children. Support is provided for children with special educational needs and/or disabilities and children who speak English as an additional language.